Burgaw, NC is a charming small town in Pender County’s River Country, about 25 miles north of Wilmington, NC. 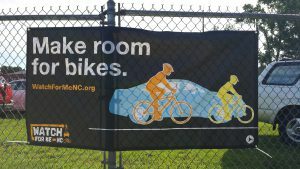 The community recognizes the benefits of walking and bicycling. Burgaw’s Bicycle and Pedestrian Master Plan emphasizes the importance of safely connecting residents to parks, shopping, and schools to promote a healthy lifestyle. The historic center of Burgaw is mostly walkable, and while investment in bicycle and pedestrian infrastructure is increasing, not all parts of town are safe for people walking or riding a bicycle. North Carolina Highway 53 and US Highway 117 bisect the heart of downtown and carries heavy freight traffic. The lack of crosswalks can be challenging for pedestrians. 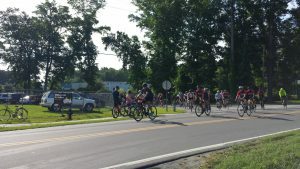 Burgaw boasts one completed 2.2 mile greenway which follows the Osgood Canal through town, and with the Westside Trail in the planning stages, Burgaw is hoping to utilize Watch for Me NC to improve pedestrian and bicycle safety through outreach, education and enforcement activities. 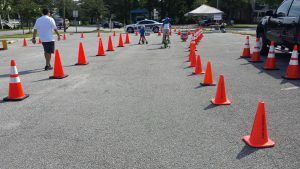 Town of Burgaw Police worked most closely with the Town’s Planning Administrator and the Parks and Recreation Department to improve pedestrian and bicyclist safety. The town created a broad coalition with a diverse set of local partners. Assistance was provided by the Burgaw Elementary School, Burgaw Middle School, Pender County Board of Education, Pender Memorial Hospital, Pender County Health Department, Pender County Parks and Recreation Department, Burgaw Chamber of Commerce, Town of Burgaw Public Works, Town of Burgaw Fire Chief/Safety Administrator, Burgaw United Methodist Church and ArtBeat. In their first year of participating in the Watch for Me NC program, Burgaw focused on extensive public outreach and education. Staff handed out flyers and brochures at the Tour de Blueberry upon acceptance to the program, taking advantage of statewide press exposure during the North Carolina Blueberry Festival. Burgaw worked to build staff buy in early by handing out materials at the Southeast Police Officer Training at Burgaw County Community House on June 30. A Watch for Me NC Kick-Off Meeting in July was attended by a long list of partnering organizations, including the Burgaw Police Department, Planning Department, Parks and Recreation, and Health Department. Further educational materials were distributed at events such as an annual bike rodeo conducted by the Cape Fear Cyclists and Burgaw Police Department, Walk to School Day, the Back to School Bash, a Local Government Day at Burgaw Elementary, the Halloween Boo Bash and the Chamber of Commerce’s Business Expo. Billboards in neighboring New Hanover County and in Wilmington reinforced the Watch for Me NC campaign regionally. Local press has been very receptive to the Watch for Me NC safety message. In turn, public support for the town’s work implementing pedestrian and bicycle infrastructure projects has been bolstered. With comprehensive local outreach for Watch for Me NC, Burgaw has laid groundwork for successful participation in coming years. Collaboration with regional Watch for Me NC program partners expands and supports local efforts. Communication with Watch for Me NC program staff is helpful. The resources on the Watch for Me NC website enrich program implementation. Thanks to Burgaw Police Chief Jim Hock, Karen Dunn of the Burgaw Planning Department and Zach White of the Burgaw Parks and Recreation Department for their work on the Watch for Me NC program and for the information presented in this community profile.